Hi, in this post u will learn how to prepare spinach soup. Spinach is very nutritious and highly rich in Vitamin A ,Vitamin E, Vitamin K, Folic Acid.......and many more elements. It is very much liked by small babies aged 8 months to 1 year. Also its a perfect appetizer. Add the rinsed spinach in the boiling water . To this add chopped onion , garlic , green chillies and salt. Allow the mixture to boil for atleat 10 to 15 min such that spinach and onion turns tender. Now turn off the heat and allow the mixture to come to normal temperature. Now grind this mixture to fine semi-liquid paste. 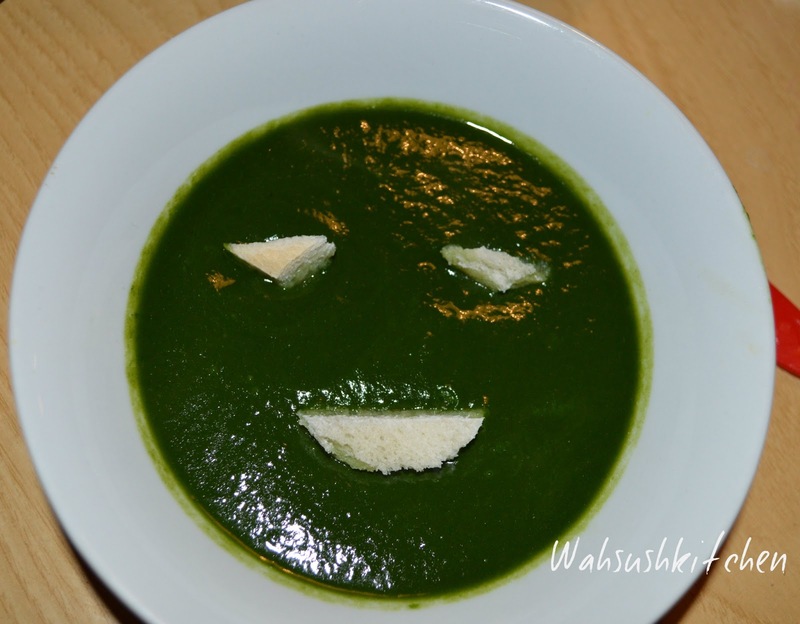 Garnish it with some fresh cream and bread at the top.Your spinach soup is now ready to serve.